Meet the Life Reflections team! Judy Kramer, Michael McCauley, Sarah Long, Sheena Nicholson and Crystal Stroud provide confidential counseling for individuals, couples & families in Elkins, Randolph County, West Virginia. Judy is a licensed independent clinical social worker and the owner of Life Reflections. She is a graduate of the West Virginia University school of social work where she earned her Master's degree, and holds a Bachelor's degree in psychology from Edgewood College in Madison, Wisconsin. Judy has extensive experience in the field of mental health, with over 30 years work history ranging from teaching,public speaking, grant writing, and case management to psychotherapy in which she's provided individual, couples, family and group therapy. In December of 1996, Judy opened Life Reflections and continues to run the business in addition to providing therapy and teaching seminars and workshops. She sees a range of clients but specifically enjoys working with adolescents and adults. Judy loves spending time with her dogs, and brings her two miniature schnauzers Ziggy and Rivka into her sessions to assist with the therapeutic process. She also enjoys hiking, cooking and traveling. I have been working in the mental health field since January 2009. I worked for five years in community mental health, as a Supervised Psychologist. During my years in community mental health, I primarily worked with adolescents, but also some adults, many of whom were in treatment for substance use disorders. Then, in January 2014, I began working in corrections, providing mental health services to incarcerated individuals. I was granted my psychologist license in November 2015 and continued to work in corrections. In November 2016, I began working part-time at Life Reflections. I enjoy working with clients of all ages and from all walks of life. In my free time, I love cooking/eating delicious food, camping, writing, spending time with my nearest and dearest, and paying lots of attention to my two dogs. Cynthia, AKA Cindy, is a licensed professional counselor, licensed social worker and a nationally board certified counselor. She has worked for 20+ years in the field of mental health in a variety of settings to include specialized foster care, crisis intervention, a residential adolescent facility, an alternative school setting and in private practice prior to joining the staff at Life Reflections. A native of West Virginia, she relocated recently to the Elkins area. She enjoys working with a range of individuals including adolescents, their families and adults of all ages. She enjoys creative outlets including stained glass, writing, gardening of all varieties, and re-purposing old items into something different. Crystal has been a long time member of the Life Reflections team since October of 2009 and works diligently behind the scenes, taking care of billing, spending endless hours on the phone and doing paperwork to keep the business end of Life Reflections flowing smoothly. Crystal is a proud mother of two boys and loves to spend time at the beach. Marlena is a licensed social worker with 10 years experience working in mental health. Marlena has held a wide range of positions in corrections, couples, and family therapy. Marlena recently joined our team here at Life Reflections, LLC and is currently seeing a range of clients. In her free time, she enjoys hiking, kayaking, yoga, and family. This bright eyed, energetic miniature schnauzer with a huge personality comes to work every day with his owner, Judy. He's always there to help out in her sessions in case a client needs support from a furry friend. Ziggy is very social and he likes to greet clients at LR as they sit in the waiting room or pass through the lobby. He is the youngest pup on the team, and loves playing, going for walks, and meeting new human friends! Chester (aka Chessie) is a doberman pinscher rescue dog who found his forever home with LR in 2010. Chester is a sweet and gentle soul, who is timid and startles easily. Because of this, he works behind the scenes, mainly residing in the kitchen which serves as the heart and central meeting place for LR staff. Although mostly unseen by clients, every once in a while you can hear a deep loud bark ruminating from behind closed doors, which is just Chessie reminding you that he's there. 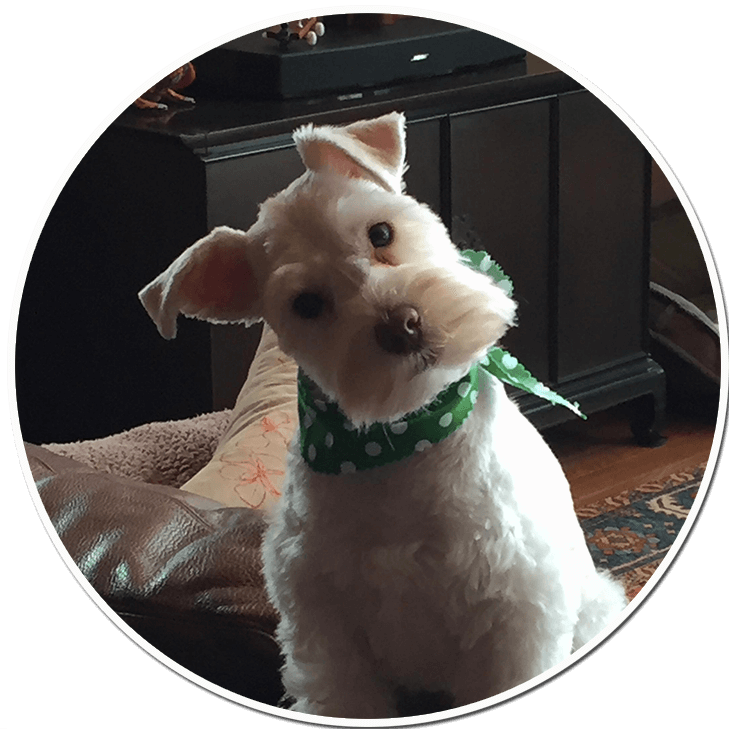 Rivka (aka Rivy) was a miniature schnauzer who joined the LR pack after her beloved owner's passing in 2013. Sweet natured & kind hearted, Rivka also sat in on therapy sessions and intuitively provided comfort to those who may need it. Rivka enjoyed playing and romping with the other dogs and was always happy to be the recipient of a good belly rub. She's missed. Zoe was a miniature schnauzer who was a big part of LR during her lifetime until her passing in 2013. She loyally accompanied her owner Judy to work every day, rarely leaving her beloved owners' side. She was the wise & experienced leader of the pack and was loved and respected by the other dogs. Her calm, wise demeanor was a constant presence and she is missed by both staff & clientele. Zoe's spirit lives on in our hearts, memories, and in the mission that LR carries out every day.